Dry and tired eyes. Fast and long lasting relief. Clinically proven. Sprays directly onto closed eyelids. Stabilises the eye's natural tear film. Soothes and rehydrates. Moisturises the eyelids and areas around the eyes. Suitable for daily use and use with contact lenses. 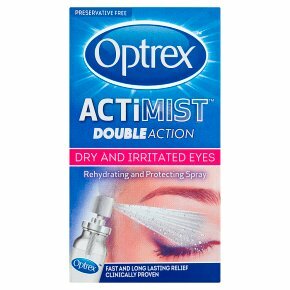 Optrex Actimist Double Action? Rehydrating and Protecting spray quickly rehydrates and stabilises the natural lipid layer of your eyes tear film. Specially designed to give you lasting relief in quick, easy spray: Easy and quick to apply-just spray on closed eyes anytime, anywhere With Pro-Vitamin B5, to moisturise the eyelids and areas around the eye. Directions for Use: Adults and Children (2+ years) 1. When using for the first time, push down the nozzle 3-4 times. 2. Hold 10cm from your closed eyelids. 3. Spray 1-2 times onto the closed eyelids, 3 to 4 times per day. Before use, please read leaflet for full instructions, warnings and precautions for use. Children must be supervised by an adult. Keep out of sight and reach of children.<br><br>ONLY FOR USE ON THE EYES.